Chang Yuchen: Snake and Others Installation View. Photography by Chang Yuchen. Courtesy Fou Gallery. Opening Reception: Saturday, 14 December, 2013, 6-8 pm. Sound Performance by the artist at 7 pm. 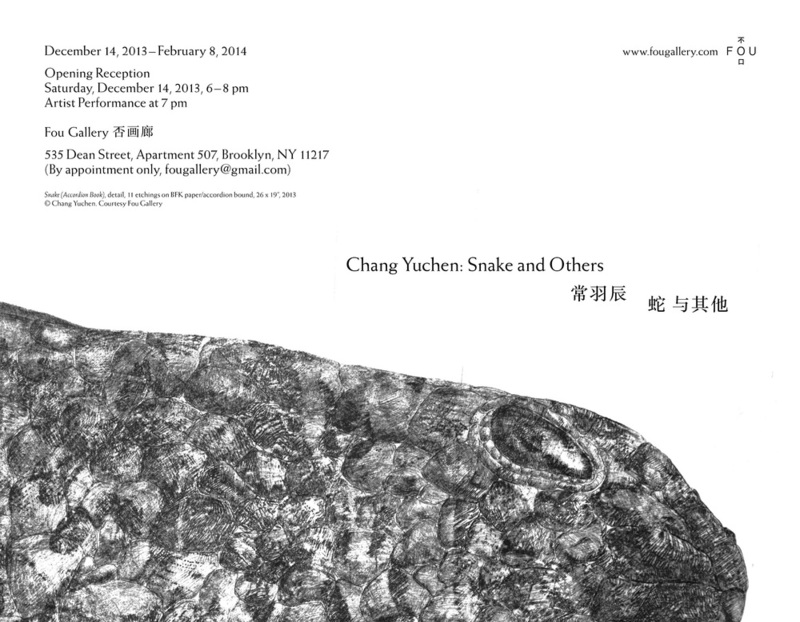 Fou Gallery is pleased to present the inaugural exhibition – Chang Yuchen: Snake and Others. Featuring two recent series – Snake and Bonsai, as well as a group of glass engravings Fingerprint inspired by the alternative apartment space of Fou, the exhibition marks Chang Yuchen’s first solo exhibition in the United States. In addition to a comprehensive selection of her recent works: print, pencil on paper and artist book, the artist will present a sound performance at the opening reception, 7:00pm. The exhibition is accompanied by a self-published catalogue designed by Ming Bai, including an essay by Lisa Wainwright, Professor and Dean of Faculty at School of the Art Institute of Chicago, and a fairy tale about snake by Echo He, co-founder and curator of Fou Gallery. In Chang Yuchen’s works, the snake is a metaphor, present in a rather abstract and fragmented way. As the artist argues, the image of snake is culturally transparent, because “the knowledge to which the snake seduces, that of good and evil, is nameless.” (Walter Benjamin, On Language as Such and on the Language of Man, 1916) For Chang, the image of snake is a carrier of nuanced textures of pencil drawings and etchings that she started to experiment on since 2012. While working on pencil drawings for the Snake Book (2012), she found the effects created by pencil and eraser could achieve a similar impression of the snake skin. It’s the vestige left over time, the surface worn out by movement and the complicated texture caused by constant abrasion that shared by her drawing and the skin of wild snakes, that later on led her to etching. The process of etching is a long and drown-out process of damaging, physical and chemical, during which the surface of the copper plat becomes a scar-ridden battlefield, and the print end up a record of the scars, a map of body gestures, a history of a quiet but relentless war.